GREEN BAY — Mike McCarthy will not reassume play-calling duties to help spark the Packers’ ailing offense. McCarthy was referring to his team’s 29-10 loss in Denver on Sunday. The Packers gained just 140 yards and Aaron Rodgers threw for only 77 yards. The team’s wide receivers have been criticized for not getting open against the Broncos’ No. 1-rated pass defense. “This is not a one-position issue. Our total plays are way down. This is not just about receivers getting open,” McCarthy said. The Packers will face the 7-0 Carolina Panthers in Charlotte this Sunday. The Packers defeated the Panthers, 38-17, at Lambeau Field last season. What’s different about the Panthers? “The biggest thing is they’re healthy. They’re playing good football. The way they’re running the ball and the combination of run and pass (Cam Newton). This is a big challenge for our offense. 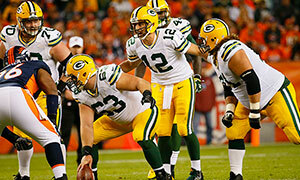 This is a very balanced, well-rounded football team,” McCarthy said.